Choosing Between Cooper Vs Non-Stick Cookware for your kitchen. There are many great cookware brands out there such as Calphalon and All-Clad who make some really high end stainless steel and copper cookware. However there are also a lot of very high quality non-stick brands also. Choosing between the two will often come down to budget. Having the right cookware in your kitchen can make it enjoyable to cook as well as improve the aesthetic appeal of your cookware. If you are torn between copper and non-stick cookware, you need to understand the cons of these two types of cookware as well as understand how they can benefit you and your cooking. Doing so will allow you to make the best decision for your family and ensure that you do not overspend when buying a new cookware. In addition to being incredibly attractive, copper also has a number of benefits that the home cook will love. 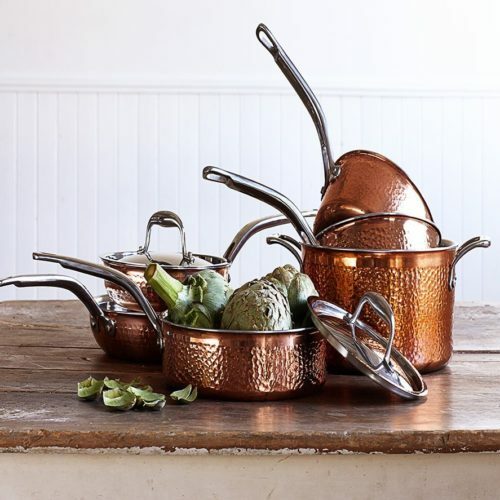 While being a very expensive type of cookware to buy, copper does an amazing job at cooking evenly, which means that you have very few hot spots and are less likely to burn your meals. These pots and pans heat up quickly and hold heat evenly, making cooking even intricate and difficult meals a breeze. Users who want to display their cookware out in the open often opt for copper just because of the beauty of this cookware. Unfortunately, copper is very expensive, which often means that homeowners can only purchase one or two pieces of this cookware for use. Additionally, copper is reactive, which means that both alkaline and acidic foods may have a slight metallic flavor when they are cooked in this type of pan. Many times, manufacturers will line the copper cookware with tin so that foods do not react. This does not affect the aesthetic appeal of that your copper cookware, but may cause them to heat a little unevenly. While this type of cookware is relatively new compared to copper, it has a huge fan base simply because it is much easier to cook meals without your food sticking to the pan. This means that cleanup is very easy and that you can use less fat when you are cooking. Non-stick cookware has a few drawbacks that users need to understand before opting for this choice. While cleanup is easy, this is because the pan has been coated with chemicals that may actually be carcinogenic and will release fumes when heated to high temperatures. You can avoid this problem by not preheating at very high temperatures and by using a fan in your kitchen. Additionally, non-stick cookware does not heat up evenly the way that proper does, which means that you may have hot spots in your cookware that can easily burn your food if you’re not careful. It’s only by weighing the pros and cons of these two types of cookware that you can find the ones that are right for you and your family. Many homeowners prefer to have multiple different types of cookware in their kitchen for various uses, as this allows you to choose a cookware type based on how it will perform for the meal you are making. For example, intricate dishes where you need control over the heat will most likely benefit from being cooked in a copper pan, while items such as scrambled eggs may perform better in a non-stick pan.